I cracked my Ray Bans and replaced them with these. They are mint condition, with all original packaging. LOVE them. Perfect size. These are the slightly larger sized aviator for those wondering. 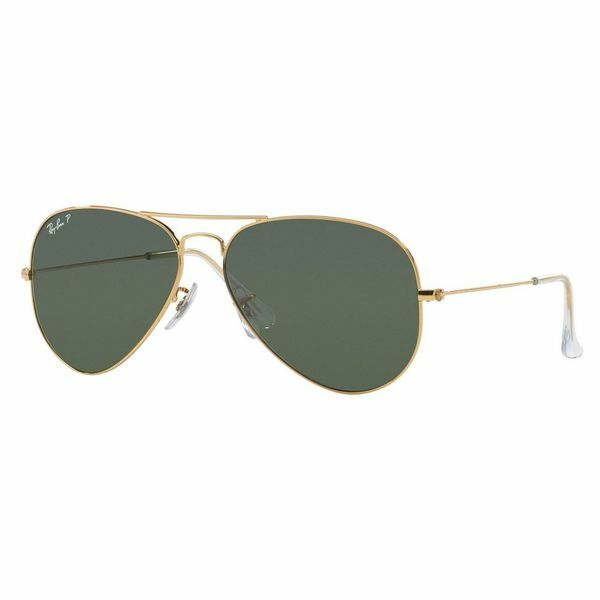 Ray-Ban RB3025 Aviator sunglasses encompass the shape that started it all. This is an iconic look that has endured for nearly a century, and are now updated with polarized lenses and popular color schemes. These fashionable sunglasses have a striking gold metal frame and green lenses for a clean, classic look. The lenses are polarized and anti-reflective to provide you with the clearest and most comfortable view on even the brightest days. A protective coating provides 100 percent protection from UV rays so you can safely spend all day outside knowing your eyes are protected. I was nervous ordering these based on the reviews. These are 100% authentic and made in Italy. Came with case, info packet and cleaning cloth. Great sunglasses and perfect size! Polarized lenses are amazing in the early morning glare. Highly recommend if this will be your only pair of Ray-Bans. Classics! Just like the one I tried in Macys only significantly less! Greenish lens with gold frame combo is timeless in my opinion. Received lots of compliments. Do take note of the size. These are large frames, which is what I prefer. I love the larger size of these aviators. These look good on most everybody. Great glasses, excellent quality. Highly recommend these Ray-bans. Excellent fit and quality. Authentic polarized Ray-Bans. I purchased as a Christmas gift for my husband and he is thrilled! My only recommendation is to be sure to check the measurements listed in the product description work, before you purchase. Thank you, Overstock! I am so happy I found these. My husband has wanted a real pair of Ray-Ban's (not a knock-off) for over 30 years, so on Father's Day we got these for him. He was thrilled! These were genuine Ray Bans with the correct case and cards. I was very happy to see them on Overstock for much cheaper than other stores. Try them on somewhere before you buy them, though; you really do need to figure out your correct size. I love these glasses and wear them just about everyday! Can't go wrong with a classic! Great product ! Would have paid over *** in the store. Good quality & nice price! One can not go wrong with Raybans!! my boyfriend was very happy to receive these. "Do these say "Made in Itay" on the arm etchings? " "I just purchased these and am hoping they are 58mm as stated with crystal lens and gold frames. That is what is stated in the description. Thanks"
"Why does it say country of origin is China? Shouldn't it be Italy for an authentic pair?" Ray Ban has manufacturing facilities that produce authentic products in both Italy, and China. Hello darlene, yes these are brand new. Please let us know if you have any further questions. Hello Jenolaf, please be assured that these are 100% authentic. Thanks for shopping with us. Hello Rolex1, yes these are polarized. Please let us know if you have any further questions.